The 2nd Volume of the original Warhammer White Box is a very interesting one. For starters it has a lot of elements that would fit a Role playing game better than a mass-combat wargame. Secondly, the magic item section gives the reader a summary glance into the setting-background as originally conceived, naming locations and some mythical personae. The snippets gleaned from the magic item descriptions paint a picture of a world inspired by Middle Earth to no small extent! But let's not get ahead of things, and dive into the original magic system of Warhammer Fantasy. Volume 2 introduces the reader/player to three new characteristics, Mastery, Constitution and Life Energy. Mastery and Constitution are familiar statistics for Oldhammer players. Mastery being a Wizard's power level, rated 1 to 4 (as it would forever remain) and determines the ability of a wizard to cast spells and which spells are available. Constitution was the harnessed raw magical power a wizard could summon to cast those spells. 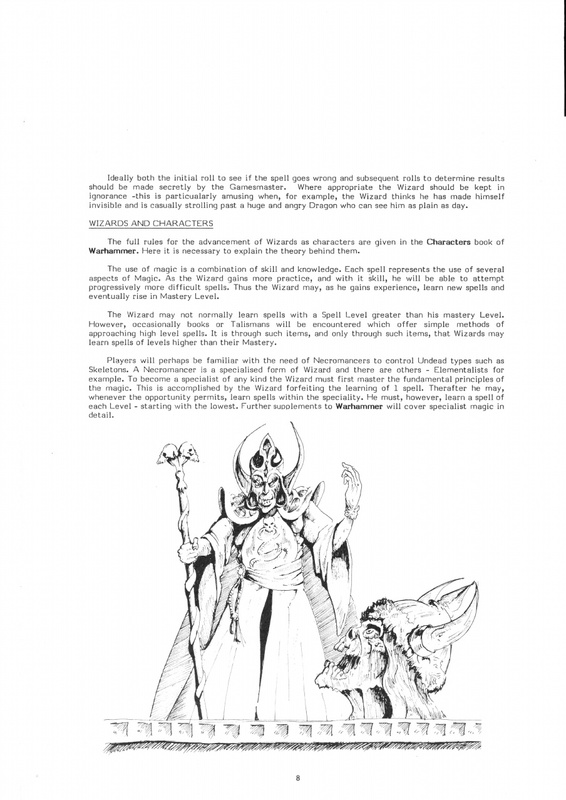 Life Energy was abandoned in 2nd edition, and even here it's described as only relevant in a role-playing campaign, but basically it represents the physical and mental price a wizard pays for using arcane powers, draining away slowly as a wizard expends constitution leaving him eventually an emaciated (and possibly deranged) wreck of a creature. The paragraph on Life energy claims that the subject is covered in detail in Volume 3... but it's not (we'll get to that later). 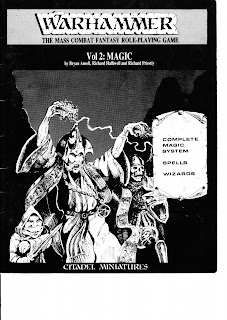 In Recenthammer (4th and 5th edition) and Newhammer (6th edition and beyond), Mastery Level is just an indicator of general power and number of spells available to a wizard, practically on a point-for-point basis, a level 2 wizard knows 2 spells, a level 3 wizard knows 3 etc. 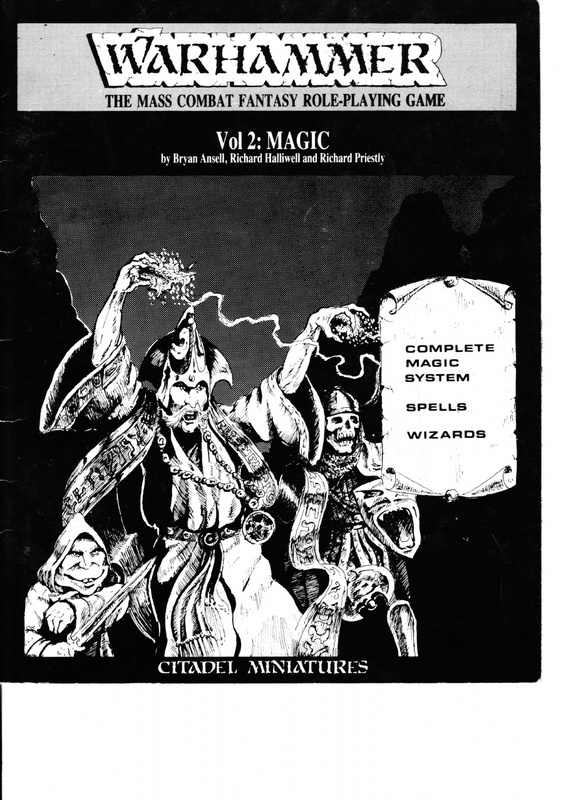 In Oldhammer the magic system was much closer to Role Playing magic systems, most notably Dungeons and Dragons when it comes to ability/power/spell levels as spells are divided into mastery level categories, requiring a wizard to be of a certain level to know particular spells, just as D&D. In addition, we get casting times and recovery times for wizards, some spells needing some time spent in some form of ritual not detailed, while others apparently put some form of strain on the caster one would need to recuperate from. Practically all spells also require ingredients to be cast, mostly philtres of some 'humour' or other, or Talismans. Again a very RPG feature which was abandoned for the wargame but retained with some modifications in WFRP. Enhancing and Annihilating is the bluffing-game of dispelling magic aimed at wizards, secretly assigning constitution to dispel or enhance spells cast. The Fumble Factor presents another rule that is in many ways geared for campaign play as one of the triggers of the Fumble test is when the wizard attempts to cast a newly learned spell for the first time (would you use that in a war game battle?). Essentially it is a system for spell-failure or miss-casts, and a bit of a balancing factor for wizards, as attempting to cast spells of a higher level than current mastery give a modifier to the test. Like morale, the chance of fumbling is affected by the wizard being wounded. The effects of a fumble can be quite disastrous, hitting yourself, allies or causing opposite effects! One might even buff enemy units by fumbling. Volume 2 also gives the first random generation table for characters, player or non-player depending on the type of game being played. Here we get the wizard generation tables, giving rules to generate mastery level (on a d10), constitution (2d4 per level), if a wizard is specialized or not (d6 table, 1:3 chance of specialization), number of spells and which spells. Characteristics are to be generated using the rules in Volume 3, though are modified in relation to mastery level (+1 WS, I and W per mastery level). The list of spells is quite large, 75 are provided, though not all of them are useful in a normal table-top battle, many being utilitarian kind of spells (lock, detect hidden doors, far sight) while others have only cosmetic -albeit comical- effects like curse. 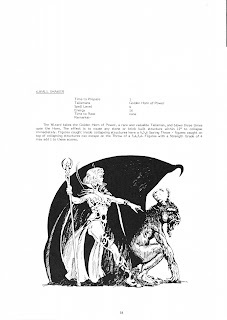 Of note is that there are as yet only 2 lores of magic (general and necromantic), no distinction being made between general magic and elementalism, illusionism and deamonology. Any evil wizard may summon deamons, Balrogs even! Necromancy is quite a small lore though, only 15 out of 75 spells are necromantic. The greatest value in this chapter is in my opinion not the rules, but the world building notes presented through the magic item descriptions, especially among the magic weapons. And did you know the original warhammer world had realms known as Borunna and Bloodren? Human realms that have some magic crafting bladesmiths. The dwarves of course are as ever, champions of ironworking and Firsthammer gives us the first look into the realm of the Dwarves. Originally the Dwarven Kingdom was called Caraz-Adul, its strongest fortress being Caraz-A-Carak, nice to see the current Dwarf Capital's origin in the first ever Warhammer game! 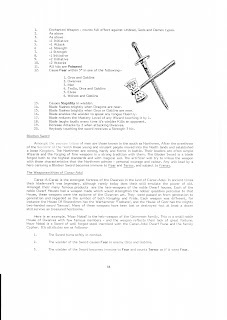 It elaborates further on the “heir-weapons” of the Dwarf nobility and gives a shout-out to Volume 1 by mentioning the magic hammer of the Dwarf commander in the Ziggurat of Doom scenario (Foebane). Together with foebane, we only get rules for two weapons from the Dwarven Forges, but the presumed loss of Foebane at the Ziggurat is a nice plot-hook for an adventure. Names, locations, artefacts, I could get a lot out of this part of the book. A lot of items described could be a quest objective of some kind and I feel many who would review this edition from a wargaming perspective would overlook and miss out on the scenario opportunities presented here. Also, the description of Garathea's Cord is classic warhammer slapstick! I get a strong notion that Firsthammer's target audience would have been the regular customers of Games Workshop back then. Not only did I learn that it was meant as freebie with mail order parcels (thanks Orlygg), but the rules are not detailed, clear and unambiguous enough to be an entry-level wargame. Firsthammer is for experienced gamers who can come up with their own stuff and especially roleplayers who want to now and again fight a bigger battle. Concluding, volume 2 is in my opinion one of the best Firsthammer booklets for the good read the enchanted items chapter provides and the implied adventure hooks transcend the warhammer game. I'd advise any GM who runs a Fantasy RPG to take a look at that chapter and take an idea or two from it for adventures or magic items... So, let I also pose a question to the readers of this blog: what items would you have fun to write into a quest or adventure?